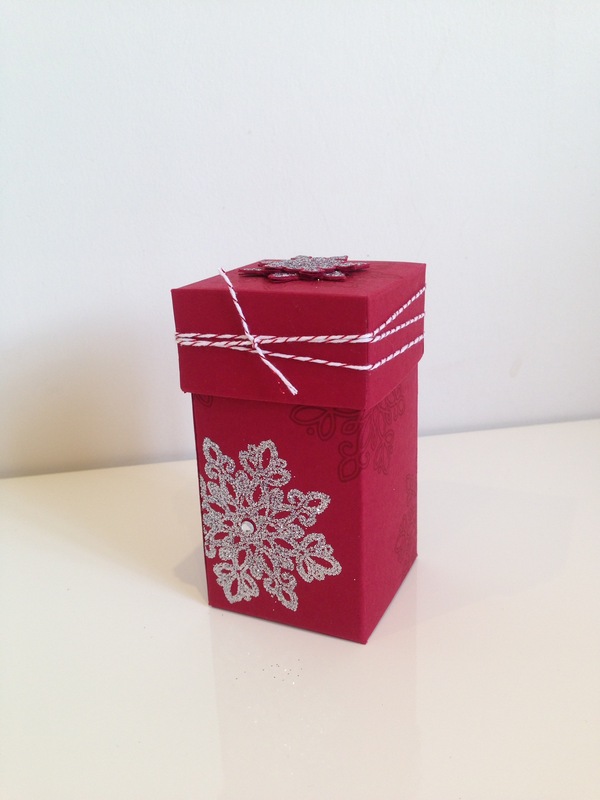 I just wanted to share with you my gorgeous Christmas gift box which is a great size and measures 10cm x 5cm x 5cm. I used the lovely FLURRY OF WISHES stamp set along with the co-ordinating SNOW FLURRY punch. The card stock used on this project is CHERRY COBBLER with accompanying CHERRY COBBLER BAKER’S TWINE. Finally I have decorated it with SILVER GLITTER and RHINESTONE BASIC JEWELS. To make the glitter stick perfectly you’ll need aVERSAMARK pad, HEAT AND STICK POWDER and the HEAT TOOL. Hope you enjoy making this box and if you’d like to join one of my demonstrations on a Saturday afternoon then please just contact me here. ‹ PreviousDesigner Series Paper SALE!